Beautiful certificate from the Grand Theatre, Croydon Limited - issued in 1930. This historic document has an ornate border around it. This item has the signatures of the Company's Director's and Secretary and is over 77 years old. Split on left margin. 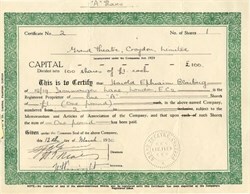 Certificate was issued to Harold Ephiaim Blaiberg. The Grand Theatre, Croydon, was built by Brough in 1896 and opened on the 6th April of the same year. The Theatre was originally used for Plays and Melodrama but by the 1920s it became a touring house. The Theatre closed in the early part of the war when Croydon was extensively bombed, but reopened in the latter part of 1942. After the war the Theatre continued with repertory and also housed an annual Pantomime. The Theatre closed in 1957 and despite a huge petition for its rescue it was finally demolished in 1959.